Sacred Threads Hippie clothes. Sacred Threads Bohemian clothing. Artsy clothing for creative people who aren't afraid to show a little color! 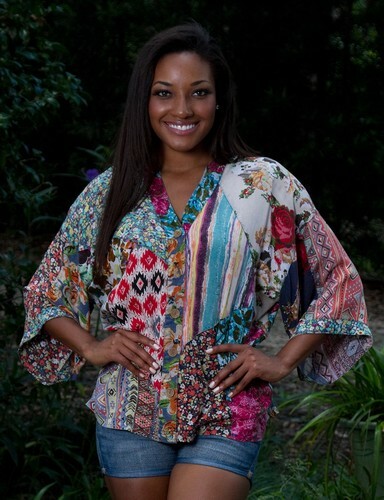 100% Rayon Carnival peasant boxy oversized kimono top made from a combination of Carnival patches. Very oversized and roomy. Button front, kimono sleeves. All of the patchwork pieces are from the Carnival group of fabrics however patches will vary from item to item. Each garment is a unique piece of art created just for you and will not look exactly like the picture. Because of the handmade nature of these garments, sizing, color, pattern, and fabric swatches can vary from item to item. The measurements represent an average of this particular item. The item in the photo is NOT the exact item you will recieve. Check the measurements below.